We all love to put back spin on the cue ball. Who doesn’t? Watching the cue ball make contact, hesitate, then scream back towards us is rewarding all on its own. This love for back spin can sometimes cloud our judgment when playing good position. The draw shot has its place in position play, but let’s not neglect the power and control of top spin, or the follow shot as it is referred to.“You draw for show, and follow for the dough” is a quote I heard over and over as I was learning the game. Looking back I found the truth in this statement. Controlling top spin is much easier than controlling back spin. 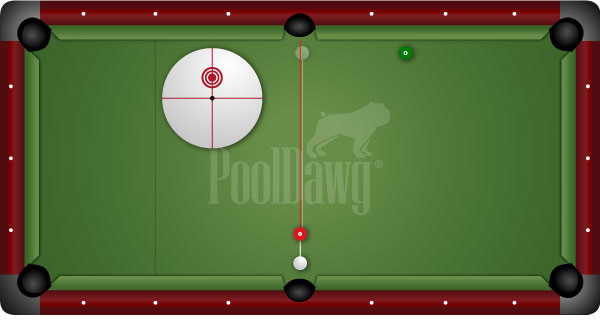 In Figure A, you can see a situation in a game of 9-Ball. We have ball in hand, and must play position from the 5 ball to the 6 ball. At first glance, our instincts tell us to just shoot the 5 ball into the side pocket that it is closest to and draw the cue ball for position. This is a viable solution, but why not place the cue ball on the other side of the 5 ball and shoot it in the opposite corner with top spin? This shot is much easier to control the speed to obtain the perfect angle on the 6 ball to lead us to our next shot. If you practice this shot you will find that your speed control is far more consistent than with the draw shot. Both are good options, but when you are under pressure, why not take the option that has more chance of success? Frank Says: "The only thing that will help your draw and follow shots is practice, but practicing with a hi-tech training tool like the OB DigiCue BLUE makes practicing more effective. Check it out!" Figure B shows us a completely different scenario. This time we are playing a game of 8-Ball and we need to pocket our last stripe and get position on the 8 Ball. Once again drawing the ball could be a good option but it is fraught with the peril of scratching in the side pocket. The best solution is to combine top spin with a little bit of running english (side spin that is going the direction of the cue ball as it rebounds off the rail) in this case right hand spin. This shot comes up often and you should practice this shot often to develop your consistency with it. 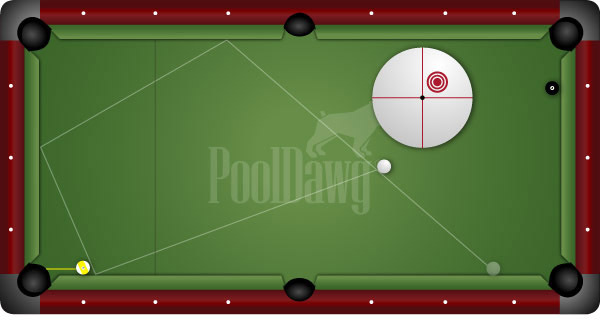 If you pocket the stripe with high-right spin, it should send the cue ball three cushions for position on the 8 Ball. One of the most important things with a follow shot is make sure you are hitting the cue ball above center, with a level stroke and follow through. Remember, backspin is fun, but following the ball is more controlled! Both shots are deadly weapons in your pool arsenal, but knowing which one to use is just as deadly.